Ironing isn't usually on the top of anyone's list of fun things to do, and it can be even worse if your iron is sticking to the fabric or spraying dirty water. With just a little maintenance, you can keep your iron working well, looking great, and make ironing easier and more productive. If you have a steam iron that sputters and leaves mineral-filled or rusty water spots on your clothes, it means the steam vents have become clogged and the iron needs a good cleaning. You can purchase commercial steam iron cleaning products that promise to dissolve the clogs, but some iron manufacturers will void the warranty if you use them. They can be harsh and cause additional damage. The best thing to use is distilled white vinegar. It is more gentle and less expensive. To get started, mix one-half cup of distilled white vinegar and one-half cup of distilled water. Pour the mixture into a cool, unplugged iron. With the iron in an upright position on a sturdy surface, inspect the steam ducts. If you can see white residue in the holes, use a wood or plastic toothpick or old toothbrush to clear away build-up. Never use anything metal that could scratch the soleplate. Next, plug in the iron, turn it on and set it to the steam feature. Allow the iron to heat for at least five minutes. Depress the steam button and hold for 20 to 30 seconds or until steam flows out freely. Do this at least six times. Turn off the iron, unplug it, and allow the iron to cool completely. After cooling, empty out any remaining vinegar/water mixture from the reservoir. Even if you are meticulous about using distilled water every time you iron, you should use the vinegar/distilled water mixture every few months to keep your iron steaming at its best. Iron soleplates should never be scrubbed with anything harsh that can cause scratching. Once the finish is marred, it is nearly impossible to prevent rusting or staining. The soleplate can get gummy and soiled by starch or sizing residue and should be cleaned regularly. To clean the soleplate, be sure the iron is cool and unplugged. Mix table salt or baking soda with a bit of distilled white vinegar to make a paste. If you choose baking soda, the vinegar will cause it to foam so mix in a bowl large enough to contain the foam. Dip a clean white cloth into the mixture and use it to scrub the soleplate. Rinse by using a clean white cloth dipped in clear water. If something plastic has melted onto your iron, unplug and cool the iron. Fill a shallow pan with ice cubes and place the melted plastic-stained part of the iron on the ice. Let it sit for five to 10 minutes to harden the plastic. Use a blunt plastic knife to scrape away the hardened plastic. Then, clean the area using the vinegar/salt mixture. If the plastic has transferred to the clothes you're ironing, place the fabric in the freezer for at least one hour. Use the same technique of a dull plastic knife to gently scrape away the plastic. This will be slow going and may not remove the plastic completely. To protect your soleplate from damage, try to never iron over metal zippers, snaps, hooks, or pins. 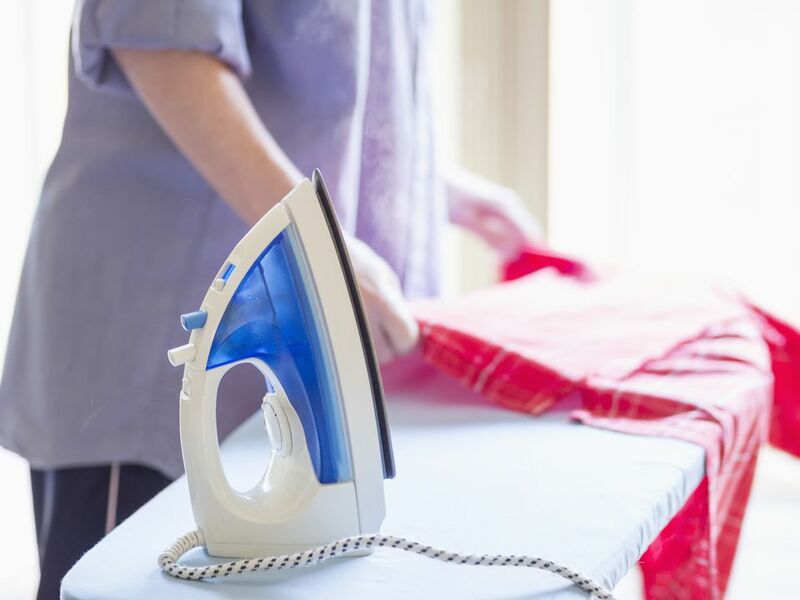 The cost of an iron can vary widely and selecting the right iron for you depends a great deal on how often you iron clothes and linens and the type of things you iron. There are different sizes and features to consider for seamstresses, crafters, and the once-in-a-blue-moon iron users. Once you have purchased an iron, there are a few things that you should do to prevent problems. Water from your kitchen faucet, even if you have a filtration system, contains minerals and even chemicals that can cause problems with how your iron functions. The minerals can corrode the water reservoir in the iron and ultimately clog the vents or spray rusty water over your freshly cleaned clothes. Always use distilled, bottled water when filling an iron. Storing the cooled iron in an upright position will prevent any leaking of water and it will prevent the soleplate surface from becoming scratched or corroded. Any damage to the soleplate can transfer to your clean clothes.